HAMMERED SILVER TEXTURE BATH SET by Accent Plus home decor, jewelry, decor, decorations, electronics, fountains, floor mats, art glass, vases, garden essentials, fireplace screens. 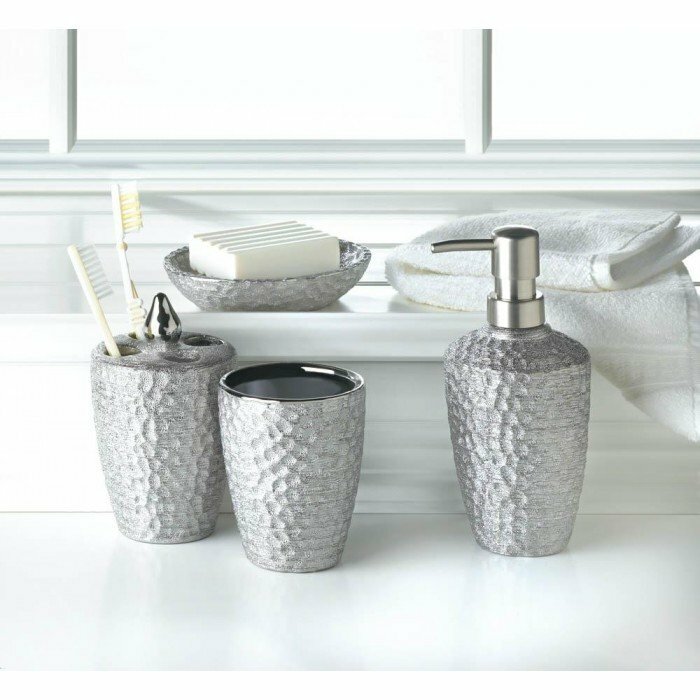 Your bathroom will shine with the hammered silver metallic finish of these luxe bath accessories. You'll love the chic look of the included pump, toothbrush holder, soap dish and cup. Lotion dispenser: 3.375" x 3.375" x 7.375" high, tumbler: 3.25" x 3.25" x 4" high, toothbrush holder: 3.75" x 3.25" x 5.25" high, soap dish: 5" x 4" x 1" high. Material(s): PORCELAIN. Weight 2.86 pounds. Dimensions 3.38" x 3.38" x 7.12"